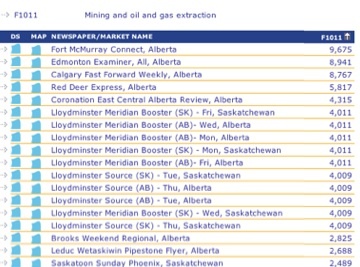 StatsCan data and the AdWest GIS system was used to highlight a collection of 'best bet' markets and newspapers for an agency specializing in HR and recruitment. The agency for a well known airline wished to assess community media options based on the potential $$$$ of the market served by each title. Generation 5 Consumer Spending Data: Airplane Travel (SUM) data was layered against audited coverage footprints to create a ranking of all 270 AdWest member newspapers according to annual expenditures on air travel occurring within the market. The agency was able to assess the value of community media on a title-by-title basis using metrics that were both quantifiable and justifiable to their client. This is an actual screen shot of the report in the application prior to export. 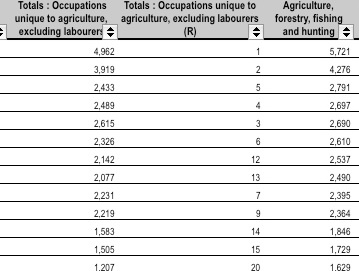 Using the raw table data, thematic density grid maps can also be created to view raw tabular data in geographic form. 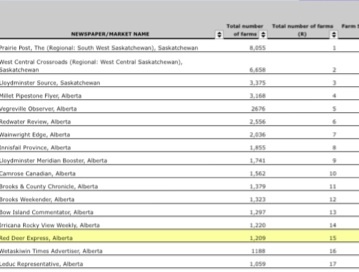 The agency wished to see where, within the coverage of the Saskatoon Sunday Phoenix there was a greater propensity for purchasing air travel tickets. 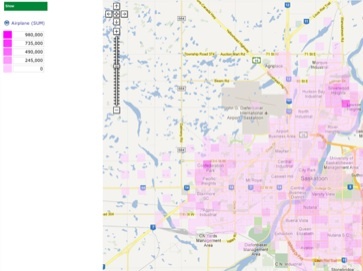 Data was plotted on the map grid to identify areas of high spending within the coverage area. Note: each square on this grid represents a 500m X 500m area. The agency is provided with ever greater clarity and context of the value of this publication to their client. 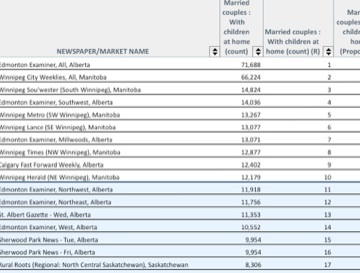 Using 10 of the approximately 10,000 available datasets, AdWest's GIS application was used to match a list of client target criteria to newspaper coverage area. AdWest's GIS application allowed for the alignment of target criteria with coverage areas highlighting appropriate newspaper/market options.